The fintech sector in the Middle East and North Africa (MENA) region is flourishing driven by the large pool of financially underserved individuals and businesses, and a thriving e-commerce sector, according to a report by the Wamda Research Lab and Payfort. In the last three years, the number of fintech ventures in MENA doubled from 46 to 105. While these startups span 12 countries, over 70% of these startups are based in four countries. The United Arab Emirates (UAE), Egypt, Jordan and Lebanon are the region’s most advanced startup ecosystems and the region’s rising fintech hubs, aided by government support, the involvement of the private sector, good education levels and political stability. The UAE in particular is quickly emerging as the region leader. Already, the nation hosts as many startups as two of the other three hubs combined. Fintech startup creation is happening almost three times faster in the UAE than in Egypt, for example. 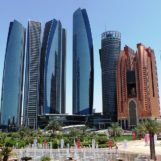 Deloitte ranked Abu Dhabi as the top fintech hub for the MENA region in its 2017 fintech hubs report. The consultancy pointed out the city’s strong financial center, stable political, regulatory and judicial regimes, its business-friendly environment, excellent technology infrastructure and availability of capital. 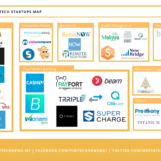 Notable UAE startups include Bridg, a consumer-to-merchant smartphone payment platform that works over Bluetooth, Democrance, an insurtech startup that aims to offer insurance and protection to the 99% uninsured population in the MENA region, and Beehive, a regulated peer-to-peer lending platform launched in 2014. 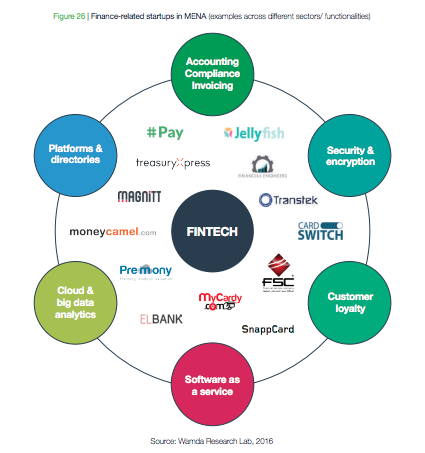 MENA’s fintech ventures cover a wide range of services from alternative lending, financial comparison platforms, insurtech, cybersecurity and accounting. Unsurprisingly, payments is the most popular sector, accounting for half of all MENA-based fintech startups, followed by lending and capital raising with 34%. Second wave startups, which specialize in international money transfer, wealth management, insurance solutions and blockchain-based services such as cryptocurrencies, account for only 16%. 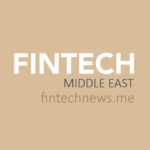 Fintech startups in MENA have raised over US$100 million in funding in the last ten years. This year alone, the sector is expected to attracted US$50 million, a 270% increase compared with 2016’s US$18 million in disclosed investments. The rise of fintech in MENA has been driven by the large population of unbanked individuals (86%) and small and medium-sized businesses (SMEs), as well as the rising e-commerce sector. In particular, peer-to-peer lending and crowdfunding platforms have proven to be popular across the region. E-commerce is forecasted to quadruple from 2015 to a US$20 billion market by 2020. The growth of e-commerce will fuel the growth of the payments space as a whole, especially startups that offer fast, secure and convenient services, including installment payments. Yet challenges remain for MENA’s fintech entrepreneurs who cited concerns about regulations, hiring and retaining talent, as well as raising investments. One in four startups shut down, and only 10% of operating fintech startups account for the majority of investment and employees. 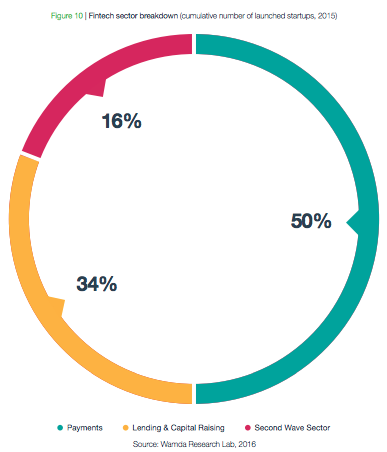 Over 85% of fintech entrepreneurs said they would relocate for better regulations. But reforms and new regulations are being set up to increase awareness on a policy maker lever. The launch of the region’s first fintech sandbox in the UAE and the new mobile money regulations in Egypt are two recent examples of this new commitment. 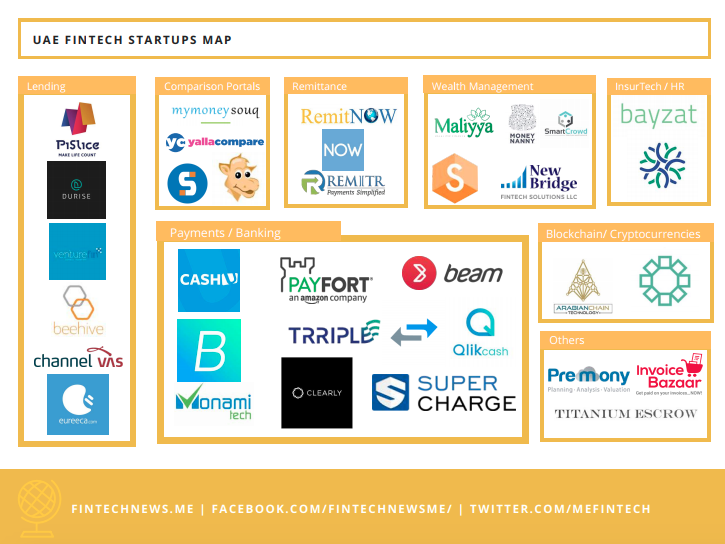 In parallel, over 20 international fintech startups have entered MENA, increasing competition in the region. These include UK mobile banking startup Dopay, Swiss blockchain startup Monetas, and UK money transfer leader TransferWise. Fintech is poised for greater visibility by 2020 with the payments sector already showing signs of consolidation, especially in the GCC region. Crowdfunding and lending platforms are set to continue to grow especially platforms with a focus on specific geographies or themes. For instance, Eureeca, an equity crowdfunding platform, is one of MENA’s first fintech startups that went global. Towards 2020, startups from the second wave sectors, including remittances, wealth management, insurance, and blockchain, will rise to prominence. “In total, we project around 250 fintech startup launches by 2020,” the report says. “Their failure rate can be lowered, their market share can grow faster and job creation can increase. 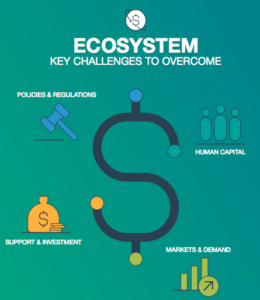 “Unlocking a virtuous cycle requires governments to step in and provide the foundations on which entrepreneurs, investors and customers democratize financial services.